FLIR Systems Australia introduces a new range of thermal imaging cameras designed to deliver excellent ergonomics, good performance and easy communication. Suitable for thermal imaging applications for the advanced user as well as the beginner, FLIR T400bx Series is available in two versions, FLIR T420bx and FLIR T440bx. While FLIR T420bx operates in a temperature range of -20ºC to +350ºC and has 4x digital zoom, FLIR T440bx operates in a temperature range of -20ºC to +650ºC and has 8x digital zoom. 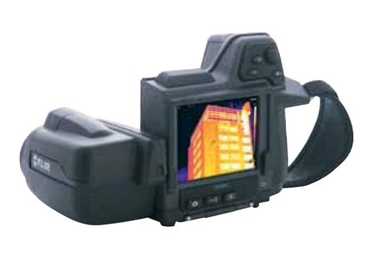 FLIR T400bx Series thermal imaging cameras meet the increasingly demanding needs of service providers and professional building inspectors who seek ergonomic systems that can be used for several hours per day, high image quality as well as time-saving features. The T400bx Series has also been designed for user-friendly operation for the first-time user. A compass is a highlight in the FLIR T440bx, enabling the inspector to be aware of camera direction as well as wall orientation during building inspections. The new FLIR T400bx Series thermal imaging cameras deliver high performance at an affordable price. Combining excellent ergonomics with high image quality of 320 x 240 pixels, the FLIR T400bx Series comes with a tiltable optical unit, which makes it possible to measure and take images of objects in all angles in a comfortable working position.